Join Friends of Foster Kids for our 3rd Annual Fundraiser on October 27, 2016 at Freedom Hill in Sterling Heights. Please support Friends of Foster Kids by voting daily in the C & G Community GiveBack Contest June 3rd-July 1st.. It’s easy! First time voters will need to take a minute to register to vote initially, but then it takes just seconds a day to vote! Vote daily, every vote counts! Helping us Change Lives…One Child at a Time! Please support Friends of Foster Kids by voting daily in the C & G Community GiveBack Contest. It’s easy! First time voters will need to take a minute to register to vote initially, but then it takes just seconds a day to vote! Click here for more detailed instructions. Vote daily, every vote counts! Helping us Change Lives…One Child at a Time! Come join in the fun at the 5th Annual Tom Powers Charity Classic (T.P.C.C.) at Castle Creek Golf Club supporting Friends of Foster Kids! Everyone is welcome!!! 4 person Scramble, $80 per person. Proceeds benefiting Friends of Foster Kids. A Cash Bar and Raffle will also be available. Hole Sponsorships available for $100 Donation. 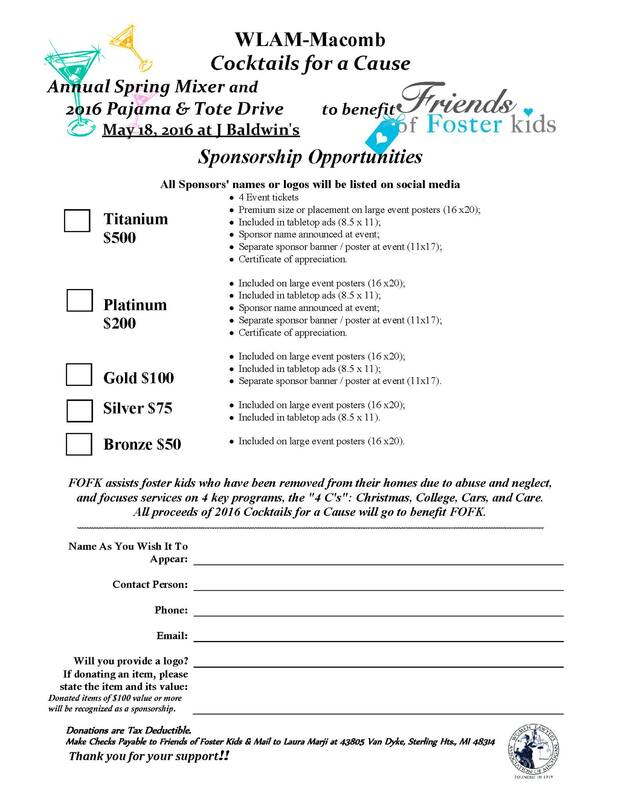 For those who wish to sponsor a hole, please download and print this form and send it along with your check (payable to Friends of Foster kids) to T.P.C.C. c/o Tony Powers, 115 State St. Caro, MI 48723. Thank you Women Lawyers Association of Michigan, Macomb Region for hosting this wonderful event for Friends of Foster Kids on May 18, 2016! Please join us in this social evening with appetizers, door prizes, raffle, cocktail ticket and cash bar. Everyone is Welcome!! Join us on Thursday, April 21st from 6-9 at the Alex & Ani at Partridge Creek! Shop for upcoming birthdays, Mother’s day, communions and just because! This is a wonderful opportunity to purchase that special gift for those special someones and support a worthy cause! Together, let’s make a difference, one child at a time! 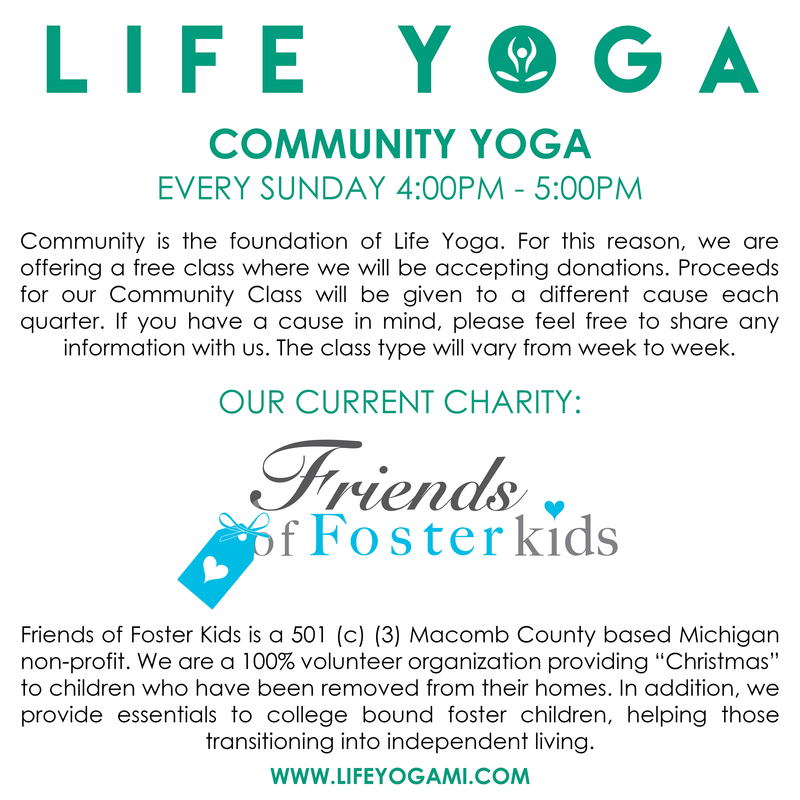 Life Yoga in Clinton Township is offering FREE Community Yoga classes every Sunday from 4-5pm where they will be accepting donations for Friends of Foster Kids. $10/person, which will go directly to FOFK. For every person who participates in the Pampering Session, I will donate $10. There is no obligation to purchase, but a portion of proceeds will be donated too! Reservations required on or before Monday, November 23rd. Either email Mary Ann Knox at mknox@marykay.com or call/text 586-822-6828 with your name and the best way to contact you. Food & Door Prizes – Everyone is welcome! One Hour of Group Fitness featuring Sandi, Nancy G, and More! Come dressed to boogie!!! It will be a fun evening filled with costume contest, prizes, and a delicious dinner buffet (soft drinks & coffee included).